Below are some of the companies and brands we’ve worked with through the years, either personally or via Osborne Strategies, LLC. If you'd like more details, feel free to ask. What's it like when you've got a simple little business and need a simple - but effective - website? That was the deal when Barkley Watersports came to Osborne Strategies for help. After some brief roadmapping, we went to work and built them an powerful, yet no-nonsense online home they love. The copy is easy-to-read and searchable, the layout is clean, and the calls-to-action are super clear. What more could an entrepreneur want? As their business grows, their website can grow with them - and we'll be there to help along the way. If you find yourself in the Cadiz, Kentucky area, and you're ready to hit the water on a fast and fun personal watercraft, give Chase at Barkley Watersports a shout! Above Average began as a personal side project that became much more than a hobby. As the only podcast of its kind focusing on issues that specifically affect big families, this show hosted by Lance and friend Bobby Ehrhardt has earned thousands of downloads since launching in early 2015. Lance is a father of five small children, so there's obviously some passion injected into the production! But creating a successful podcast requires much more than emotion. Between the initial brand development, mandatory technical chops, and the marketing know-how needed to build an audience, a project like this has to have a leader with a broad skill set for each weekly episode. Lance is that person. Working with the dedicated team at the museum, Osborne Strategies, LLC developed and helped implement a strategic marketing plan for the ROMP "Bluegrass Roots and Branches" music festival. This project included a comprehensive review of previous marketing, streamlining processes, strengthening email communications, improving traditional ad buys, and creating a new focus on brand direction and long-term planning. In other words, forget any notion of hillbillies: bluegrass is serious business. 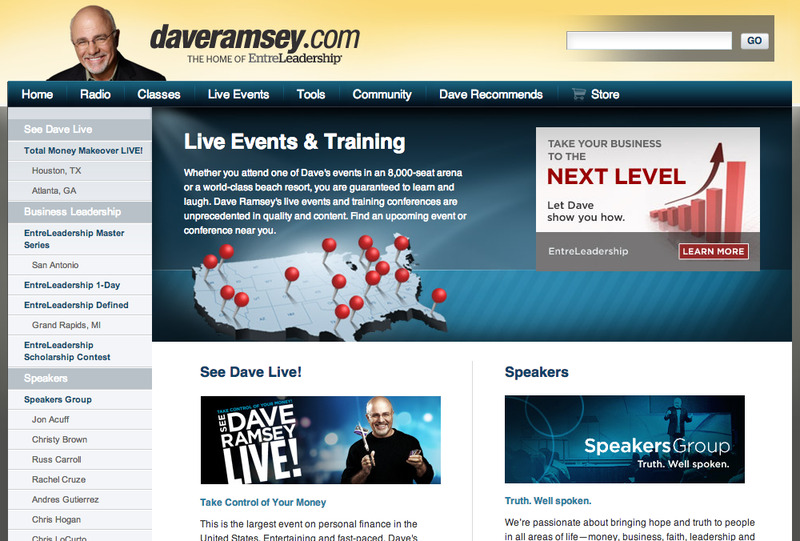 Dave Ramsey / The Lampo Group, Inc.
For more than seven years, Lance promoted radio personality and author Dave Ramsey's financial and business events across the country. He also planned onsite events (A/V, contracts, catering, etc.) and all production and sales of major streaming broadcasts. Marketing work included planning of hard copy pieces for local promotion, PR/media coordination, emails to hundreds of thousands of opt-in recipients, social media promotions to over two million followers, and radio ads heard by more than four million listeners. Nashville-based NorthStar Studios was one of the largest professional broadcast and video studios in the southeastern United States. We provided a number of marketing services, including social media consulting on new online initiatives and brand development for the company's VenueStage streaming video product. Serving as the University of Kentucky's Director of Concerts, Lance produced and promoted dozens of concerts on the school's campus. From small coffeehouse gigs to large arena shows, some of the more prominent acts included Jason Mraz, Maroon 5, Nickel Creek, Ricky Skaggs, and Nickelback. These concerts and other events featured a strategy including email, street, and traditional marketing techniques.